Gabapentin is a major inhibitory neurotransmitter that functions by binding to the GABA receptors located in the spinal cord. Gabapentin is also noted to bind to a novel site on voltage-sensitive Ca2+ channels. 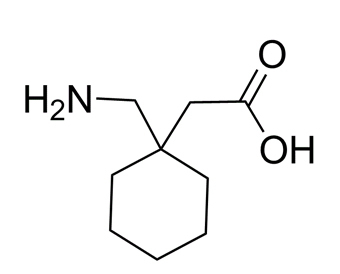 Additionally, Gabapentin is reported to demonstrate inhibition of dopamine release from caudate nucleus, prevent neuronal cell death, and is antinociceptive. It is structurally similar to GABA and is reported in various research studies to increase GABA concentrations within the brain.
. Pan CF, et al. Inhibitory mechanisms of gabapentin, an antiseizure drug, on platelet aggregation. J Pharm Pharmacol. 2007 Sep;59(9):1255-61.
. Gee NS, et al. The novel anticonvulsant drug, gabapentin (Neurontin), binds to the alpha2delta subunit of a calcium channel. J Biol Chem. 1996 Mar 8;271(10):5768-76.